By Nancy Torgerson, O.D., F.C.O.V.D. The Autism File Issue 44 (June-July 2012) features an excellent article on the transformative power vision therapy can have on the learning and behavior of children diagnosed on the autism spectrum. The article, “To See or Not to See?” written by Neil Margolis, OD, FCOVD, details his approach to performing a vision evaluation for special needs children. The article is beneficial for optometric care providers, for professionals working with those on the spectrum, and for parents, relatives and friends of people on the spectrum. Areas Dr. Margolis covers in his evaluation include eye teaming, tracking, visual processing, visual spatial judgment, and central/peripheral vision. Dr. Margolis gives easily understandable explanations for how and why these areas specifically relate to the vision issues of patients with autism. Ideas for setting up and conducting an examination that help put special needs patients at ease, making the exam process as comfortable as possible for all involved, are also described. Dr. Margolis writes, “If my evaluation suggests that a child’s vision skills may be a significant barrier to progress, a vision therapy intervention program can be designed to develop these skills.” Within the article is a parent’s first-hand account of the effectiveness of such a program as an alternative treatment alongside suggestions for locating an optometrist who offers vision therapy. Helpful tips for once therapy begins are also inside. 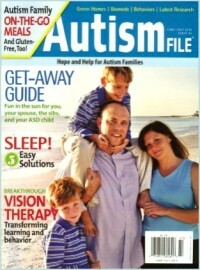 Share the post "Vision Therapy Explored in Autism Magazine"